A cold Sunday for Indore, with 98 mms from 8.30 am -5.30 pm IST, and the day's max at 23c....Bhopal saw 29 mms in the same time period. Some heavy rainfall amounts in cms as on 8.30 am Sunday for West M.P.>. BUDHNI 9, TARANA 9, ALIRAJPUR-AWS 9, NUSRULGUNJ-ARG 8. The UAC has now descended as a Low over North M.P. and adjoining U.P. (Not numbering it as BB-3, as it has originated on Land). 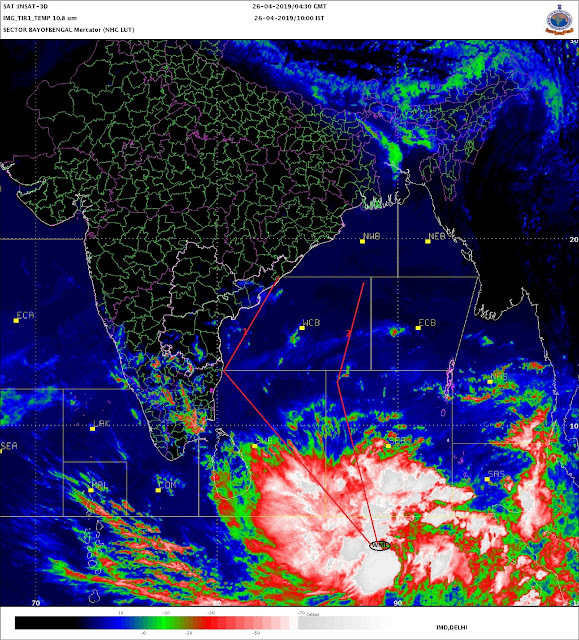 System is likely to persist in same position for another 12 hrs, before merging with the Axis , somewhere near Guna. Monday 20th:Heavy rainfall will persist in West M.P. for another 12 hrs. Rains will also occur in South Rajasthan and Eastern Gujarat. North Maharashtra region gets good rainfall. Expecting increased activity for Akola and Aurangabad district. West coast from Surat to Kerala will see enhanced rain actvity. Subdued rains in Odisha. Gangetic Bengal, TN and interior Karnataka. Tuesday 21st: Rainfall more likely in East Rajasthan and adjioing M.P. and Northern Gujarat. Subdued in East M.P, Int Karnataka and TN. Moderate rains spread to Coastal Sindh (Karachi) on 21st/22nd. Mumbai: Having missed a good chance to see enhanced rains (due to certain adverse factors), I see no reason why Mumbai cannot get increased rainfall from Monday...city should get at least 30-40 mms on Monday and Tuesday, with thunder. Pune: Monday and Tuesday has chances of moderate showers in parts of city. Around 7-10 mms possible in some areas. Goa will continue to get Showers and monsoon weather with around 30 mms/day. Surat:Rainfall increasing form Monday (maybe evening)...and good rains thru Tuesday. Would expect around 50-55 mms cumulative Monday and Tuesday. Ahmadabad: Breaking a dry spell, Chances of thunder showers on Monday and Tuesday. Expecting around 20 mms/day. Not much chances of rains increasing in Hyderabad (India) and Bangalore next 2/3 days. Karachi and Hyderabad (Sindh) will get dry weather till Tuesday, but can expect a shower in the vicinity or around on Tuesday night or Wednesday. Around 5 mms. UAC will Track West/South West, and push the Cloud Quadrant likewise. GUJ rains fury 28 june 2015 - 650mm in 24 hrs!! More rains now in store. Sir, Would this UAC bring rain in Gujarat ??? If than what could be the amount of rain. will this southwest movement bring somr much needed rain in parts of maharashtra? Can expect rain from this system in Valsad, a heavy one?? North Konkan - Mumbai,Tarapur,surat,valsad,GUJ can be under extreme spells. If it rains like june in GUJ then entire GUJ will come in excess zone!!! Already IMD has put "orange: alert. Rain/thundershowers occurred at most places over Jammu & Kashmir, West Madhya Pradesh, Madhya Maharashtra, west coast and Lakshadweep; at many places over Himachal Pradesh, Punjab, Haryana, Chandigarh & Delhi, East Rajasthan, Nagaland, Manipur, Mizoram & Tripura, Chhattisgarh, Vidarbha, Odisha and South Interior Karnataka; at a few places over Uttarakhand, East Madhya Pradesh, Jharkhand, West Bengal & Sikkim, Telangana, Coastal Andhra Pradesh and Andaman & Nicobar Islands and at isolated places over Uttar Pradesh, West Rajasthan, Bihar, Gujarat, North Interior Karnataka,Tamilnadu and Assam & Meghalaya. The amounts of rainfall (3 cm or more) recorded at 0830 hours IST of today are: Ujjain32; Agumbe23; Shajapur17; Bhopal & Agathi15 each; Raisen 14; Indore13; Canning & Dhar10 each; Kozhikode9; Hoshangabad8; Madikeri7; Manali, Shirali & Amini Devi6 each; Hirakud, Jaipur, Chittorgarh, Shivpuri, Cannur, Narsapur, Carnicobar & Valprai5 each; Golaghat, Lengpui, Pachmari, Honavar, Karipur, Mahabaleshwar, Bhira & Bajpe4 each and Delhi (Palam), Patiala, Panagarh, Gopalpur, Narnaul, Guna, Rajgarh & Rajnandgaon3 each. Good rain in bangalore this eveing. It was a typical monsoon day. LOw clouds...light drizzle and heavy breeze. Hearing its raining cats and dogs in mangalore and udupi. Karan, Sanni, Nilesh...hope your question is answered..
this heavy rain spell for west mp is a boon. record breaking rain in ujjain and now whole city is under severe flood.hope tomorrow will be some respite from rain so conditions would ease off. Sir, Would it be heavy over gujarat like MP today or moderate ?? Sir, if low merged with axis then it followed to which level of axis? Upper or sea level? When will hyderabad sindh receive good monsoon rain. City did not receive any healthy rain since last 3 to 4 year. Sanni: Rains will be heavy to moderate in the eastern region and in coastal belt (not saurashtra coast). gaurav: Low means at sea level. So it will merge at axis at sea level. The upper axis may not remain. Javed : expecting light showers in Sindh coast on Wednesday..
India 1173, Pakistan 123, United States 104, Singapore 39, United Kingdom 25, Russia 22, United Arab Emirates 14, Kenya 13, Australia 11, Germany 8. From Monday onwards Mumbai will finally stats getting heavy rains. It should peak on wednesday. I had been to ratangad(bhandardara) on sunday and it was raining very heavily all day.It seems ghat have started getting good rains. Mumbai Western line cancelled - central/harbour huge delays. GUJ in pipe line next to be pounded. Western coast trough strengthens. Unique 2015 SWM pattern - end of month last week rains pound..Aug may also be same. 2 spells of rain months quota done!!! 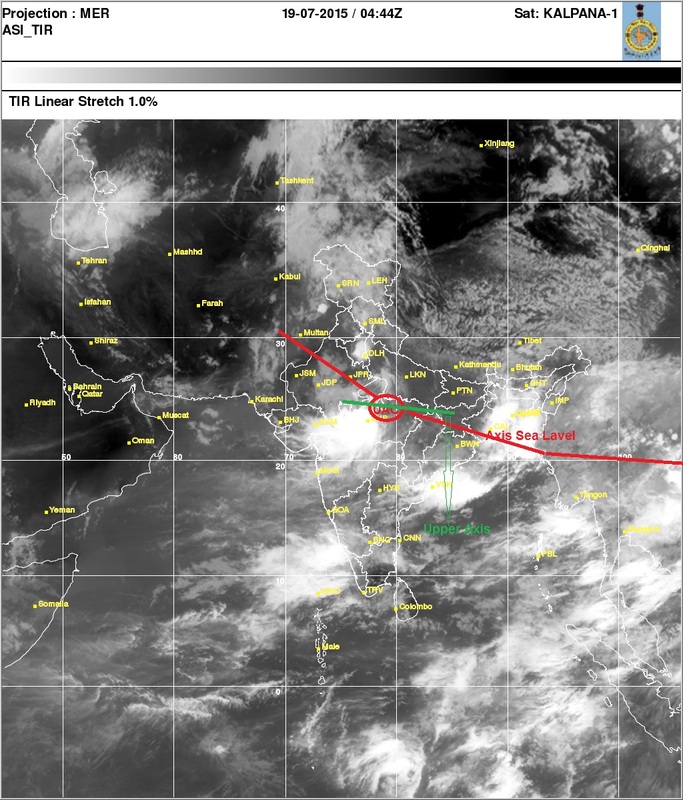 There is always risk of circulation over Arabian sea to spawn next system backfire back on MAHA/GUJ similar june.